Where did the first plants come from: One widely held theory believes that Hawaii sprang from the ocean as a volcanic peak, and eventually had permanent above water land area. It would have had occasional rainfall, and salt spray, and the inter-tidal shoreline would have been populated first with seaweed. But the land based plants had to get here from somewhere else. Maybe the first plants arrived here as seeds carried in high altitude air currents, microscopic fungus spores could travel this way too. Some seeds or living plant material were probably carried on the backs of birds, or in their bellies, and generously deposited in bird droppings. 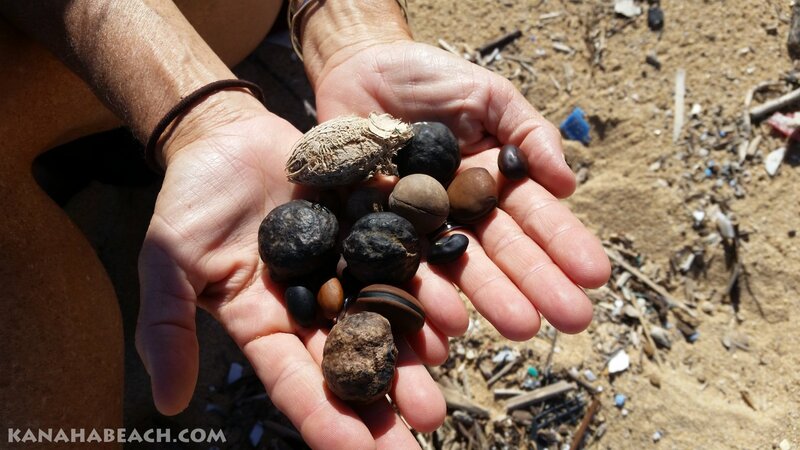 Some seeds can survive floating on the ocean, and come ashore on distant shores, like the Niu (coconut) which does this. The coconut (which is a seed) floats well and can survive for up to 4 months at sea and still germinate. It is an interesting feature of some plants that their seeds actually benefit from being in salt water for a period of time before germinating. Another mechanism for species distribution is the tsunami. Tsunamis can dislodge large trees, logs and floating debris from one location, a continent or island, and set it adrift. Large floating trees are floating rafts that could transport plant life, insects and maybe even small creatures like geckos. These processes take tens of thousands of years to build up a variety of plant life that we see in Hawaii today. After the first living creatures arrived they were kept in isolation to grow and evolve into unique versions of themselves. Species that landed on different Hawaiian islands would sometimes diverge and become entirely different species. Some species even evolved differently on different sides of a mountain ranges or on the different peaks, separated by valleys. Micro climates created micro ecosystems, that pushed diversity even further. 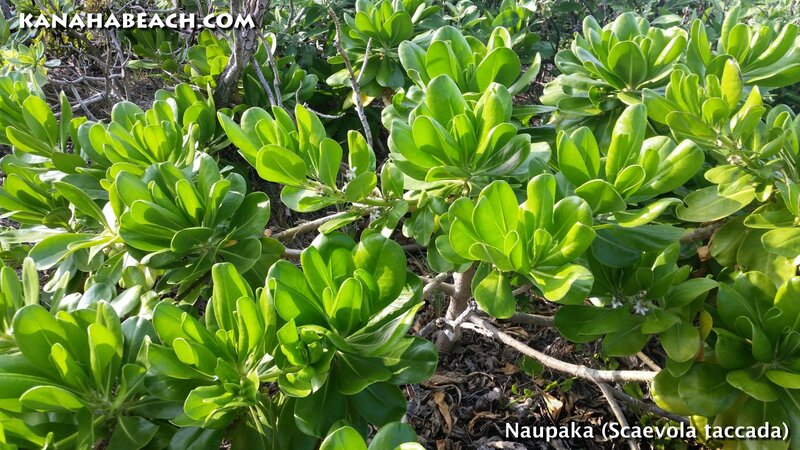 Polynesian introduced Plants: The first people to come to the islands were Polynesian voyagers, and they brought with them food supplies, and seedlings plants and animals. The needed to be able to start a settlement and have the useful plants from their homeland available to them. 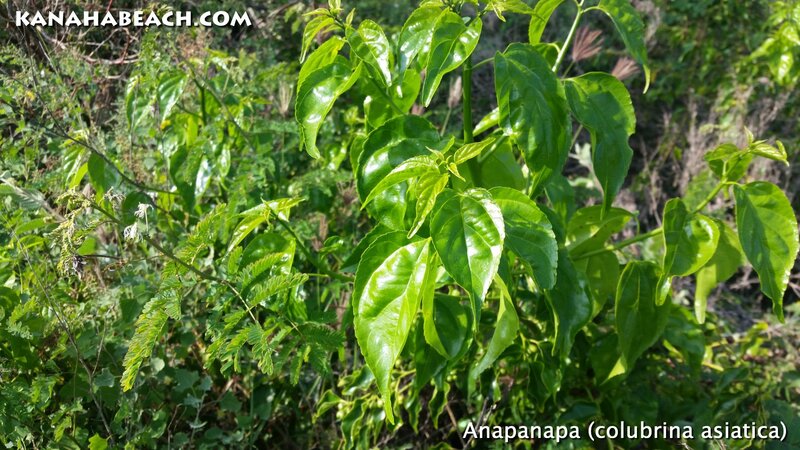 Their Plants may have been intended for food, medicinal, functional, or even ceremonial use. 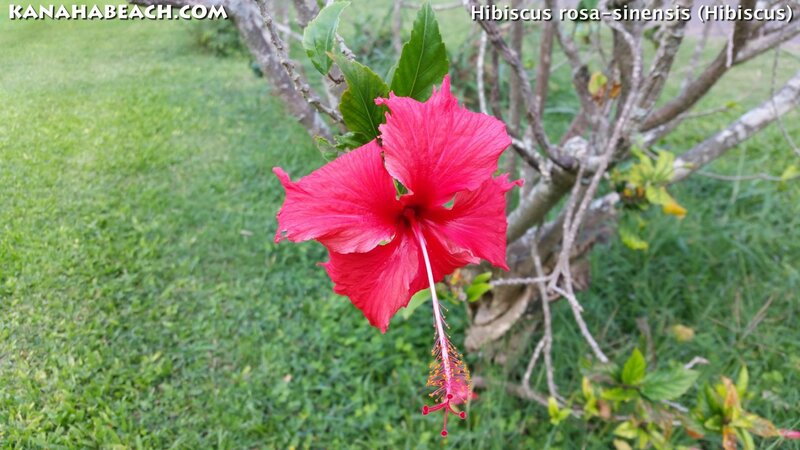 We know that many Hawaiian plants have great utility and many different uses (see the list at end of this post). 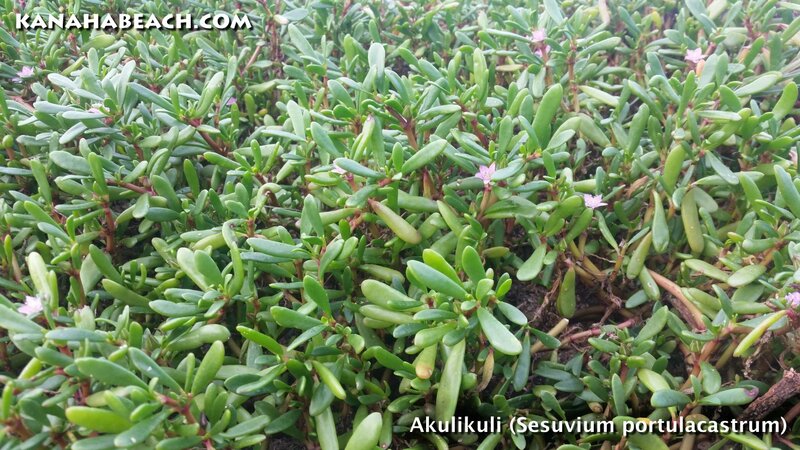 Polynesian plants are now distributed all over the pacific. Testimony to the success of Polynesian voyagers, and their ability to navigate and colonize distant lands. 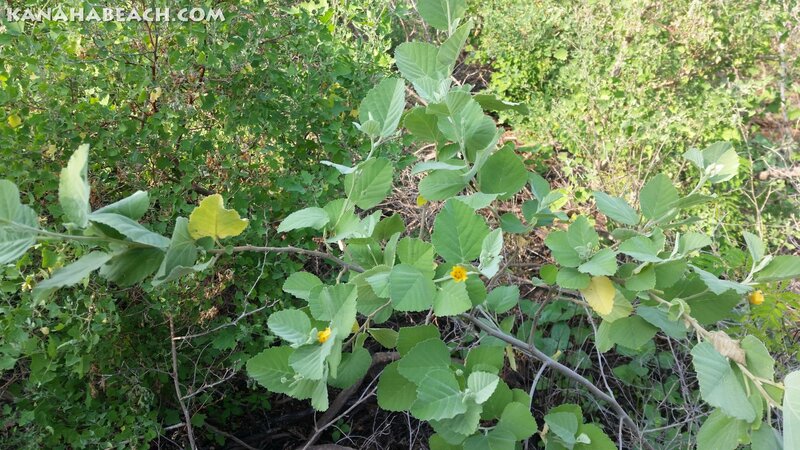 Hawaiian Canoe Plants: The plants that the Polynesian voyagers brought with them in their canoes are sometimes called the “canoe plants”. Estimates of the number of different type plants brought to Hawaii by early Polynesians is thought to be around 32 species. There is some debate as to whether the first coconuts in Hawaii were here already, even though the Polynesians would have almost certainly brought them also. Several other species, like Milo, and Hau, Kou, which are widespread coastal species fairly common throughput Polynesia, might have also migrated here by themselves. The Canoe Plants include;`Ape, `Awa, `Awapuhi, Hau, Ipu, Kalo, Kamani, Ki, Ko, Kou, Kukui, Mai`a, Milo, Niu, Noni, `Ohe, `Ohi`a, `Ai, `Olena, Olona, Pia, `Uala, Uhi, `Ulu, Wauke. Alien Species: All plants that were brought in by people are considered Alien species. 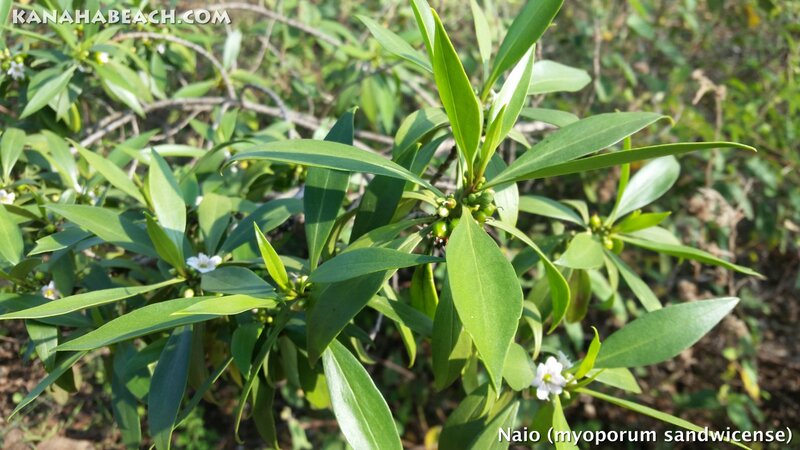 The Polynesians introductions were also called “canoe plants” are well suited to the tropical climate and have been cultivated for hundreds of years. The arrival of Captain Cook in 1778, marks the beginning of the early European introductions. Cook deliberately planted several food new food species and brought in some animals too. Some other species may have arrived by accident. Weeds, plants, and seeds can travel on ships from foreign lands, and have a way of spreading wherever they go. Native Plants impacted by Livestock: Captain Cook brought with him livestock and several plants species that he left here, and they changed the island biology for ever. Notably he left a gift of pigs and goats, with instructions that they be left alone and be allowed to multiply. These animals did multiply and ultimately ran wild. Feral Pigs and Goats started eating all types of native plants, and began causing soil erosion, and are implicated in including destroying most of the the Koa forests, along with other introduced livestock. Early livestock introductions included several types ungulates (cloven foot animals) including Goats, Pigs and Cattle. Today there an estimated 5000 exotic species in the Hawaiian Islands. Early European Plant Introductions: Many early explorers collected plant specimens wherever they went to take back for study in their home countries. Captain Cook’s ship already had many species already on board booth collected on his previous ports of call and what he brought with him from England. Cook in his journal stated that seeds of; melons, pumpkins (cucurbita pepo), and onions (Allium cepa) were planted on his first visit in 1778. Settlers and Traders: When traders, settlers, and travelers came to Hawaii they brought fruit trees, and ornamental plants for their gardens. Businessmen and entrepreneurs who wanted to farm here, brought in crops and plants that they wanted to farm here. And sometimes when those crops failed, more species and varieties of foreign plants were brought in and attempted to be used. Cattle Ranchers: Ranchers introduced fountain grass, native to North Africa, and mullein. After 1905, they introduced kiawe as another cattle feed. Kiawe trees are a terrible blight on the Hawaiian landscape, they are thorny and unplesent trees that spread quickly and can survive in arid climates by sucking up every last drop of available water, usually at the expense of the other (native) plants surrounding them. Kiawe trees are slowly being eradicated at KKanaha and replaced with Better suited local and native trees. Suffice to say all of the plants that the cattle ranchers have introduced have long since run wild and are way out of control, as tenacious invasive species. And unfortunately the cycle is about to begin all over again as a new plant for cattle feed is about to be introduced into Maui’s ecosystem, “Sorghum”. There are plans to turn Maui’s former sugar cane fields into Sorghum fields. the sorghum is intended to be used as cattle feed. So this is how the cycle of another exotic species gets started, with little thought to the long term biological consequences. Invasive Species & Biological Controls: Some crops and supplies brought in pests, insects and diseases. Biological controls were introduced to deal with pests and diseases. this lead to more alien species being released in the islands. Alien species have no natural enemies, here so that usually thrive and out compete native species, so a normal ornamental house plant from the mainland, would become a fast growing invasive weed here is a short time. Supplying Sailing Ships: As Hawaii became a port of call for whaling and trading ships, there was a need to restock these ships with water and food. Whalers wanted more than the local diet of fish and poi, so there was a market for fruits and vegetables, and livestock. 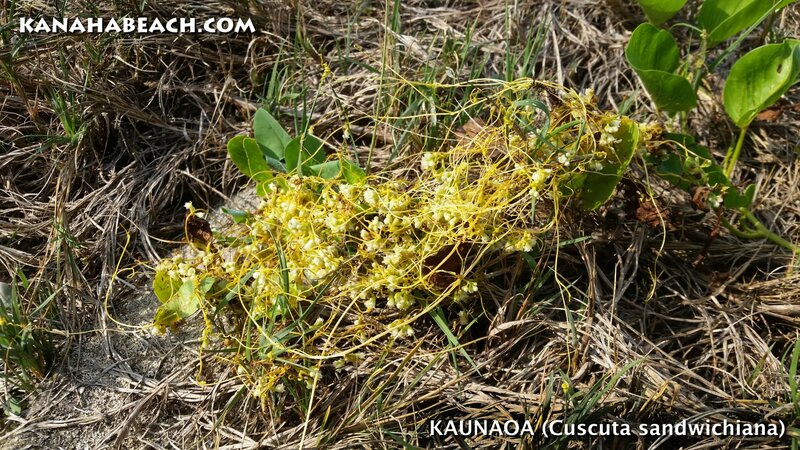 Indigenous, Endemic, Endangered native Plants: There are many rare and endangered plants in Hawaii, they are under a lot of competition from exotics. 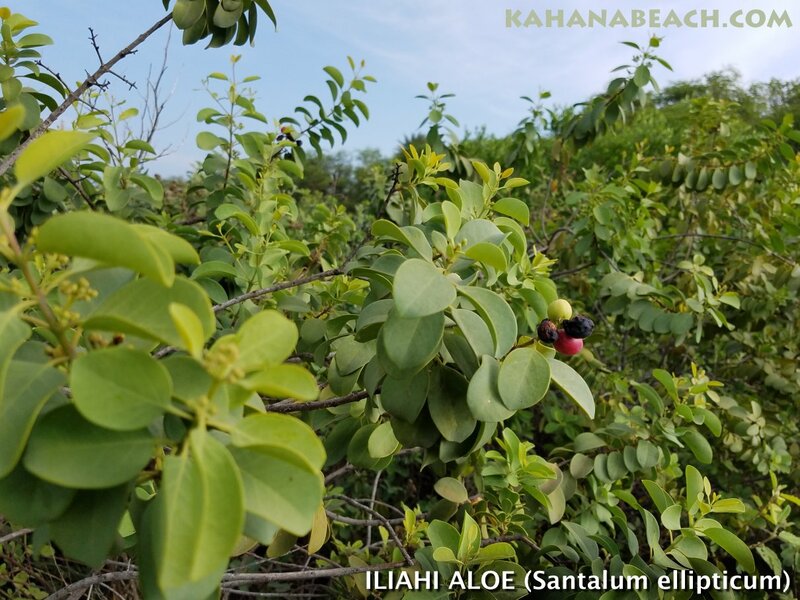 There is a growing interest in Hawaiian native Plants, and a responsibility to ensure that they do not become extinct. More and more public parks, gardens, and open spaces are being returned to a more natural state. Exotic ornamental plants are gradually being replaced with native species. And also in the shoreline areas, we are using native species to help stabilize sand dunes and to prevent erosion and soil loss. Specialized birds and bees need specific plants: Native plants have the added benefits of providing habitat for native insects and animal species. Many insects will only live on, and reproduce in specific native species. there is a lot of specialization among native species, and they need insects to pollinate the particular plant and the native insects and animals need a specific plant for food. There is also a newly discovered microbiology that is also discovered working in the soil and below ground, certain types of organisms need the dead parts of a specific plant to live, and in return supply nutrients back to the plant. MILO (Thespesia populnea) Native : Indigenous? 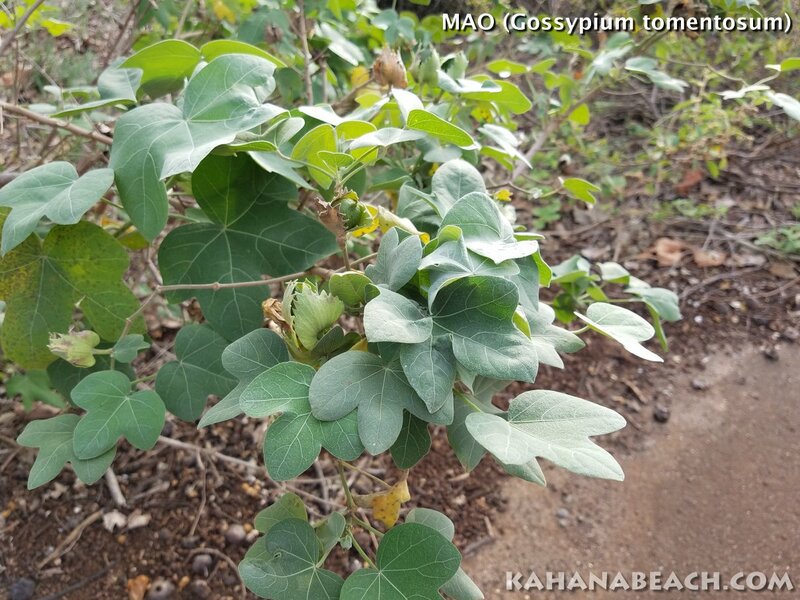 Nama sandwicensis (Hinahina kahakai) Native? Thespesia populnea (MILO) Native : Indigenous? Uhaloa (Waltheria indica) Native : Indigenous? Waltheria indica (Uhaloa) Native : Indigenous? Native = This means they are natural to the area, they are from here. Indigenous = a species is defined as indigenous to a given region or ecosystem if its presence in that region is the result of only natural process, with no human intervention. Endemic = Endemic means they are found nowhere else. Endemic means exclusively native to the biota of a specific place. Polynesian = Polynesian plants were brought here by Hawaii’s first settlers. Also known as the “Canoe Plants”. Cultivated = Cultivated plants are used deliberately, but may have escaped into the wild. Alien = Alien plants got here after first contact, usually defined as 1778 the arrival of Captain Cook. Endangered = Endangered plants are low in number so that the species is threatened. They have special legal protection too. The species name sandwicensis refers to the “Sandwich Islands,” as the Hawaiian Islands were once called, and named by James Cook on one of his voyages in the 1770s. James Cook named the islands after John Montagu (The fourth Earl of Sandwich) for supporting Cook’s voyages. 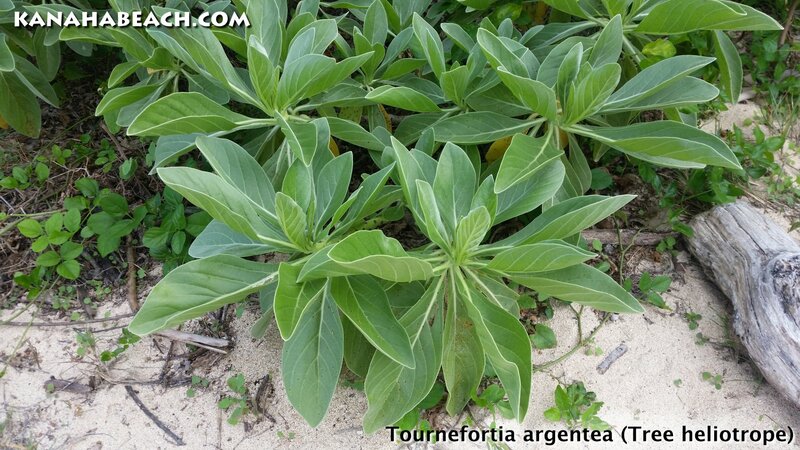 Scientific name Touchardia latifolia Hawaiian Name Olona The Hawaiians specifically cultivated this plant for its cordage. It has now been found to be one of the strongest natural fibers in the world. The Hawaiians stripped and soaked the inner bark into cordage for use in fishing lines, attaching adz heads to handles, weapons and repair.